Olympic's solar installation and ongoing energy production for the grid will become an ongoing and sustainable source for authentic project-based learning conducted in and out of the classroom. See the Press Release from Dule Energy and NC GreenPower below. CHARLOTTE, N.C. -- As part of a $300,000 grant, Duke Energy today announced it would pay 100 percent of the funds needed to install a solar power system at seven North Carolina schools. Schools applied for the grants last year. Working with Raleigh-based nonprofit NC GreenPower and modeled after its Solar Schools program, the initiative will pay the installation costs for rooftop or top-of-pole mounted systems on school property. The program also provides monitoring equipment, training and curriculum to students and teachers. "These systems will give students a chance to see solar power production firsthand and allow them to learn more about this energy resource," said David Fountain, Duke Energy's North Carolina president. "North Carolina is second in the nation for installed solar power. These seven schools will now be part of the state's success story." "NC GreenPower is thrilled to collaborate with Duke Energy on this initiative. As a small non-profit funded by donations, our reach with our Solar Schools program is limited. But through this partnership, NC GreenPower can provide greater impact to schools and students who will benefit from this technology," added Vicky McCann, NC GreenPower vice president. Any K-12 North Carolina school served by Duke Energy Carolinas was eligible to apply for the grant. 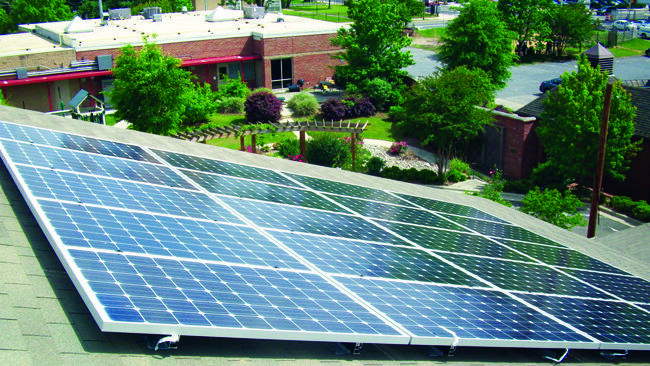 NC GreenPower will use approved solar installation companies to manage the installation process. With a renewable energy portfolio spanning more than a dozen states, Duke Energy is one of the nation's leading developers of renewable energy and has invested more than $5 billion in wind and solar projects. The company owns and operates about 35 solar facilities in North Carolina. The Duke Energy program was part of a recent settlement with the U.S. Environmental Protection Agency and environmental groups. With the mission of improving the quality of the environment in North Carolina, the nonprofit NC GreenPower was founded in 2003 by Advanced Energy. NC GreenPower helps to connect consumers with renewable energy and carbon offset providers to create positive environmental and economic impacts for our state. All projects supported by the program are located in North Carolina. In 2015, NC GreenPower launched a new pilot to support solar PV installations at K-12 schools. Contributions to NC GreenPower are tax-deductible. For more information, visit: www.ncgreenpower.org. See Duke Energy Grants $300,000 for Solar Panels at NC Schools by Time Warner Cable News for a video about the grant.